We have three Maps and three DVDs covering the waterways of the Fens. These are now available in sets of three at discounted prices. These three maps are now available as a set of three Maps saving 25% on the cost of purchasing them individually. They are available in both Acrobat (pdf) and Memory-Map (qct) Formats, as all my maps are. These three DVDs are now available as a set of three DVDs saving 15% on the cost of purchasing them individually. They are available in the same Popular, Bowcam and Combined formats, as the rest of my DVDs are. If you purchase a set of three Maps and a set of three DVDs at the same time there’s an extra 10% discount, as well as the 25% and 15% discounts described here so that makes them even better value. 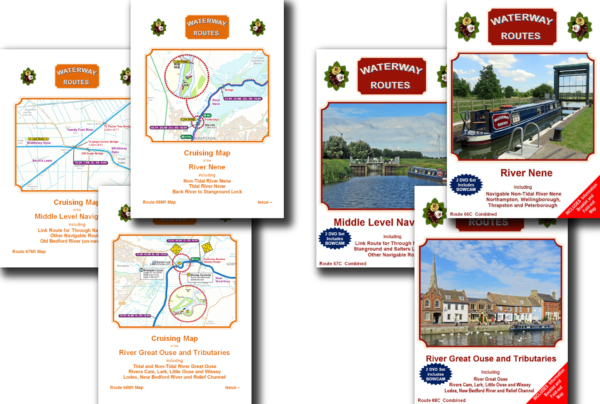 If you are cruising to the IWA Festival of Water 2018 at St Neots then these Maps and DVDs will help you plan your journey, and show family and friends where you’ve been afterwards. This entry was posted in Burwell Lode DVDs (Cam), Burwell Lode Maps (Cam), Middle Level Navigations DVDs, Middle Level Navigations Maps, New Bedford River DVDs, New Bedford River Maps, Reach Lode DVDs (Cam), Reach Lode Maps (Cam), Relief Channel DVDs (Great Ouse), Relief Channel Maps (Great Ouse), River Cam DVDs, River Cam Maps, River Great Ouse DVDs, River Great Ouse Maps, River Lark DVDs, River Lark Maps, River Little Ouse DVDs, River Little Ouse Maps, River Nene DVDs, River Nene Maps, River Wissey DVDs, River Wissey Maps, Wicken Lode DVDs (Cam), Wicken Lode Maps (Cam) by Paul. Bookmark the permalink.